The AUKANA TRUST is a Buddhist registered charity (number 326938) based in Bradford on Avon, Wiltshire, England. 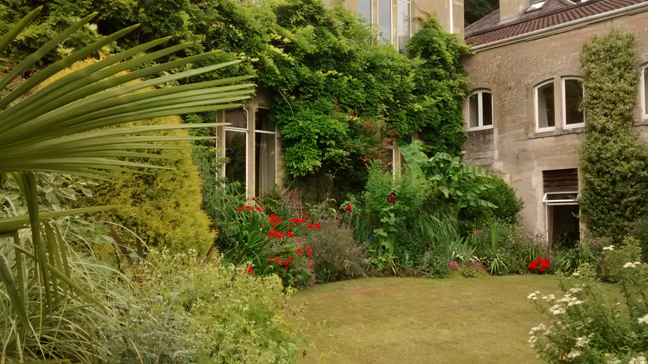 The centre was established in 1980 by the co-founders Alan and Jacqui James.The current spiritual head of the Trust is Paul Harris, who has been teaching the Buddha's path to enlightenment since 2006. The instruction offered is the traditional training in the three aspects of the Buddhist way: sila or control of personal conduct, samadhi or control of mind, and panna, the development of wisdom. The key to the growth of understanding is the practice of insight meditation (vipassana). We also stress the importance of loving-kindness (metta), generosity and service, as well as establishing a sound theoretical grasp of the teachings through study of the Pali Canon (the collection of the Buddha's original discourses). Click or touch the image to download our latest newsletter, containing articles, diary dates and a Dhamma talk extract, as well as the latest news from the centre. Our next Wednesday evening event will be a Tape and Library evening on 24th April. Anyone interested in joining the group is welcome to get in touch. We are available weekday afternoons between 2-6pm. Click here for more information about our popular Saturday workshops. More workshops will be held in the autumn. People interested in learning meditation are very welcome to arrange to come and meet Paul. These workshops have been designed as an introduction to the theory and practice of Buddhist mindfulness and are suitable both for those new to mindfulness and those seeking to deepen their practice. The day is led by the principal teacher and head of the Centre, Paul Harris. The workshops are intended primarily to be practical in nature with plenty of guided meditations, along with brief talks about the theory behind the practice. Paul very much welcomes the involvement of participants and allows plenty of time for questions and discussion. In keeping with Buddhist tradition and the ethos of this Centre, these workshops are offered entirely freely. Donations, however, are welcome. Our most recent publication is available to buy. There is a way to end all psychological distress and realise for ourselves the true nature of life beyond the mere appearance of things. Using straight-forward language and with characteristic humour, the Buddhist Insight meditation teacher, Paul Harris, reflects on the realities of the suffering inherent in life and the universal search for peace and understanding. The Buddha’s ancient training in ethical living, meditation and the cultivation of wisdom, he maintains, is as profound and effective today as it has ever been. And, with its emphasis on discovery through direct, personal investigation, it is a philosophy and practice that is perfectly in harmony with the outlook of our pragmatic, twenty-first century world. via our online bookstore using PayPal. Or you can visit our page on Amazon.co.uk. More workshops will be held next autumn. People interested in learning meditation are very welcome to arrange to come and meet Paul.